The Lower East Side’s new cinephile paradise is joining the city’s summer tradition of (mostly free) outdoor film screenings. 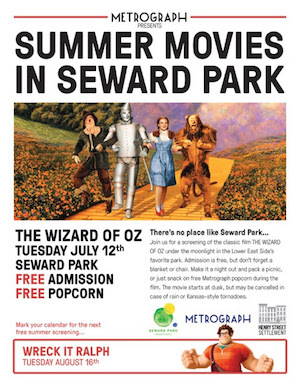 Next Tuesday, Metrograph will be showing The Wizard of Oz (the classic one, not that J-Franks nonsense) in Seward Park, at Essex Street. As Metrograph knows, half the pleasure of going to the cinema is to gorge yourself on snacks, so there will be complimentary popcorn for movie-goers to munch on while they watch Dorothy follow the yellow brick road. Head to Tompkins Square Park on Friday night for a couple of hours with classic French bad boy Vincent Cassel. Sound romantic? It won’t when you factor in Parisian riots, police brutality, macho retribution and its inevitable fallout. With this black and white 1995 drama directed by Mathieu Kassovitz, Films on the Green continues its exploration of French cinematic emblems of masculinity. Starting Tuesday, everyone’s favorite place to get shmasty in the dark is adding live music to its magic formula of movies, munchies and booze — and taking the party outdoors, for free. Nitehawk Cinema is hosting a series of “screenings under the stars” at Havemeyer Park, an old lot turned grassy knoll across the street from Domino Sugar factory.